TechnoMed Europe is a globally operating company in the medical accessory industry, with its headquarters near Maastricht Aachen Airport. Its medical accessories connect medical devices to patients and transfer their bio-electric signals. One of Technomeds manufacturing facilities is in the Netherlands. It is equipped with Class-7 Cleanrooms. Height-adjustable work tables, with direct lighting if required. The cleanroom is built by InterFlow, specialist in the field of cleanrooms, operation rooms, etc. Interflow also carries out the annual validation. 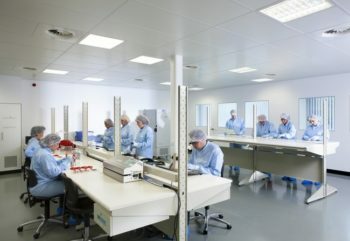 Besides the cleanroom, an office of ±19 m² can be rented. Storage of goods is possible. For incoming and outgoing goods there are several euro-pallet spaces available in the warehouse. A canteen with small kitchen is available. After consultation, a meeting room can be used. The facility is situated on the TechnoPort Europe business park, which is located on the airport along the A2 motorway. The park houses branches of internationally renowned companies. 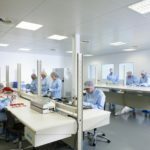 Technomed Europe has a professional team that has a great deal of knowledge and experience in the development, production and associated regulatory affairs of medical accessories. It can carry out quality checks and assist in the manufacturing of products. Technomed Europe is located on the Technoport Europe business park. This is part of the Maastricht-Aachen Airport business park, located on the A2 motorway between Maastricht and Eindhoven, about 10 km from Maastricht. There is ample parkingspace on private property. Technomed Europe is easily accessible by train and bus from Beek and Maastricht Central Station.